Another case of fraud in the ancient astronaut theory. This article has been updated to include information about Sputnik's correction. 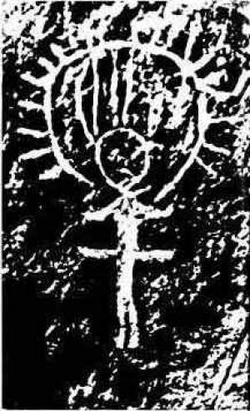 Here is how this image appeared in The Gold of the Gods, where it superficially seems to confirm all of von Däniken's claims. One of several versions of the alleged cave painting. Note that von Däniken cropped and flipped the original image. We must look and look again to grasp the significance of this prehistoric drawing. A creature wearing the headgear of an astronaut, the helmet well attached to his space suit, connecting tubes, breathing apparatus—the trappings of a space voyager. And suspended in the void: a spaceship shaped like two saucers, one atop the other. The 1967 Sputnik magazine article. The illustration, signed by the artist, is a finished, inked version of the concept sketch seen in the film. To be fair, Sputnik claimed the picture was real even though the artist's name appears on the published image, no photo of the alleged original exists, and the two extant versions of the "carefully copied" painting differ in many details large and small. 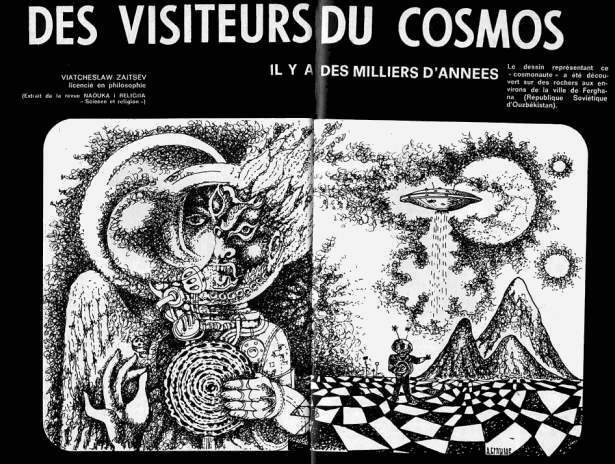 The French text reads: "The drawing representing a 'cosmonaut' was discovered on rocks in the vicinity of the city of Ferghana (Soviet Republic of Uzbekistan)." Nous nous excusions auprès de nos lecteurs d’une erreur de mise en page qui s’est produite dans notre precedent numéro en page 107. Le légende placée à droit au-dessus du dessin illustrant l’article ci-dessus rappelé ne s’applique pas à cette illustration. Elle se place en réalité au debut la legend des dessina pages 110 et 111. We apologize to our readers for a layout error that occurred in our previous issue on page 107. Weirdly enough, von Däniken reproduced the correct image in the German version of Gods from Outer Space (Return to the Stars) (1970), just before Gold of the Gods, though it does not appear in the English edition, suggesting that von Däniken either intentionally included the false image in his later books or was so careless as to not care. The correct image also appears in In Search of Ancient Gods alongside the false image, with both listed as coming from Fergana, again suggesting that von Däniken was at best exceedingly careless. The incorrect Sputnik picture also appeared in an April 1967 Flying Saucers magazine story, apparently copied from the Sputnik original. 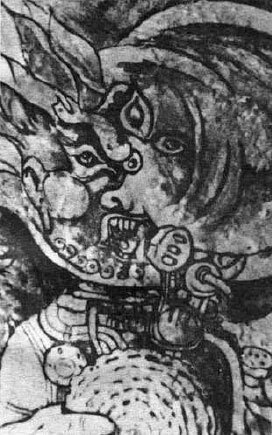 In both cases, the disc held by the "alien" is one of the alleged Dropa stones, a a series of large discs covered in hieroglyphs supposedly telling of the crash of a flying saucer and its occupants’ subsequent activities in nearby China. These discs do not exist, but interestingly the author of the Sputnik article, Dr. Zaisev, was also involved in promoting the Dropa stones. He would later confess that the image was not authentic, hardly a major concession given Sputnik's correction. It's a bit difficult to believe that von Däniken had no doubts about the painting at the time of publication, given that The Gold of the Gods carefully crops the image to hide the most ridiculous and obviously modern parts, and even reverses the image to obscure its origin. But von Däniken cared nothing for the evidence of its modern origin. Even more brazenly than in The Gold of the Gods, the complete image is reproduced, with photo credit to Constantin Film (the production company behind the Chariots film version), as figure 61 of the follow up book to Gold, In Search of Ancient Astronauts: My Pictorial Evidence for the Impossible (1973; English version 1974)--even many years after von Däniken was alerted that the picture was not ancient. 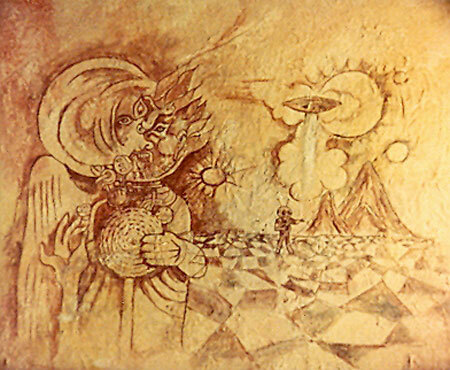 In the 1974 book, von Däniken again claims the painting is absolute proof that ancient people witnessed ancient astronauts. Sadly, this case of ancient astronaut fraud continues to be repeated down to this very day as fact despite its obviously fraudulent nature.